The paradise Isle of Sri Lanka has much to offer the most discerning traveller, from ancient fortresses to pristine beaches to the splendid landscapes of the hill stations. It is said that a traveller could go from 32 degrees centigrade to 14 degrees centigrade in a matter of hours, as Nuwara Eliya is just 180 kilometres from the commercial capital city of Colombo. In just a couple of hours, the landscape changes from city, to beaches to the cooling heights of the tea plantations in the mountains. Nuwara Eliya was built in the 19th Century during the British Colonial rule of the island, the architecture is said to mimic that of an English country town so that it was indeed a home away from home for the British rulers. Nuwara Eliya is blessed with a salubrious climate and breathtaking views of mountain peaks and grassy wetlands, not to mention the abundance of flowers that bloom throughout the year. Apart from its climate, Nuwara Eliya offers the visitor the chance to have a first hand look at a tea plantation, botanical gardens and some beautiful colonial architecture. Amongst these attractions is Lake Gregory, which is a man made tank named after the Governor of Ceylon-Sir William Gregory. This lake was created by converting the existing swamp into a lake by damming the Nanu Oya stream. The picturesque lake has attracted a number of holiday homes and tourist hotels to be built around it so that visitors may enjoy the magnificent view. The lake itself boasts a number of flora and fauna including a freshwater fish population consisting entirely of exotics. Apart from its aesthetic value the water from the lake is used for the irrigation of surrounding green houses and other horticultural activities during the dry season. 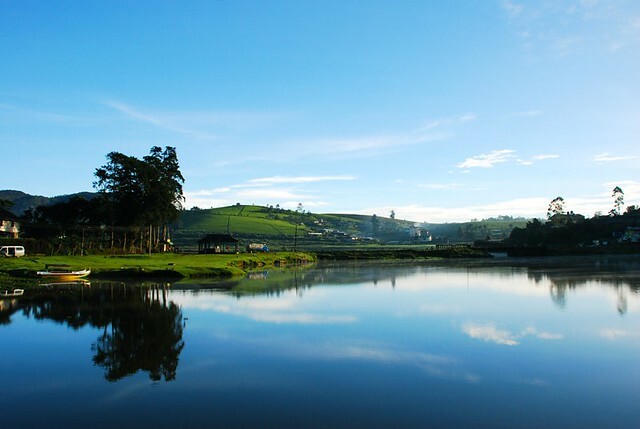 Visitors to these wetlands could find accommodations in the many Nuwara Eliya hotels that are on offer. Such establishments range from luxury to modest rest houses and one such luxury hotel Nuwara Eliya Sri Lanka is the Jetwing St. Andrew’s. This colonial residence is over a hundred years old and offers the visitor old world charm with the comforts of modern convenience.